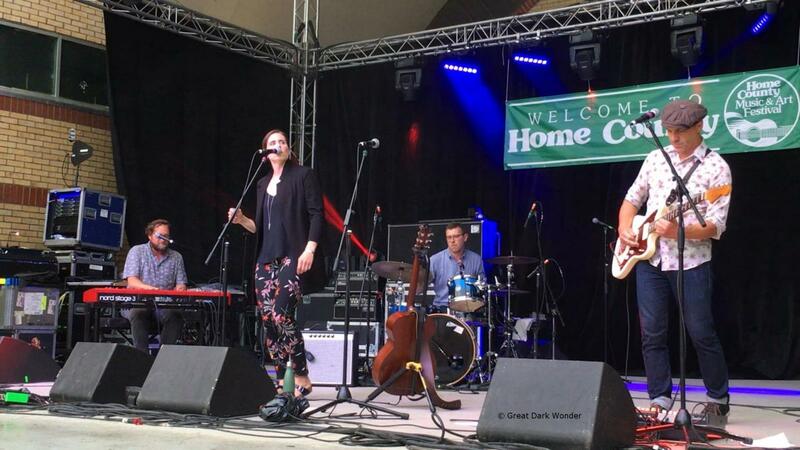 In this second installment of our trio of features on the 45th annual Home County Music and Art Festival, we feature three artists that we absolutely did not want to miss during our time in London, ON. As headlining artists on the Main Stage at Victoria Park, we experienced some wonderful live music from Rose Cousins, Mike Stevens, and Harrow Fair. Rose Cousins: Main Stage, Friday. Early last year, we purchased tickets to see Rose Cousins perform at a music venue near Philadelphia, but unfortunately, our travel plans were thwarted by a last minute snow storm that decimated the East Coast. Disappointed about this missed opportunity, our excitement level peaked when Rose was announced as a featured performer at Home County this year. Yet prior to taking the short walk from our downtown hotel to Victoria Park on the Friday evening, a sudden potent freak rain storm pummeled London for a short while and left us with that uneasy sense of déja vu. Seeking shelter until the downpour had passed, we made our short walk with a strong sense of pride. No way would bad weather separate us from a Rose Cousins live show this time around. Receiving their well deserved applause, Robbie would exit the stage, while Rose took her position at the keyboards to perform “Lock And Key,” which she declared as a jazz piece. Maintaining this momentary light jazz mood, Rose would not only perform the popular track “Grace,” but would invite Donovan Woods to join her on-stage and add his distinct harmonies. Taking his temporary leave after this song, Rose would surprise all with another great cover, opting this time to share the Bruce Springsteen track, “If I Should Fall Behind.” Donovan Woods was invited back for a second time, and accompanied Rose for her finale; a return to her new album and a powerful rendition of “Chosen.” This was a superb 45 minute set on the main stage, and left us hungry for much more from this incredibly gifted performer. Mike Stevens: Main Stage, Saturday. 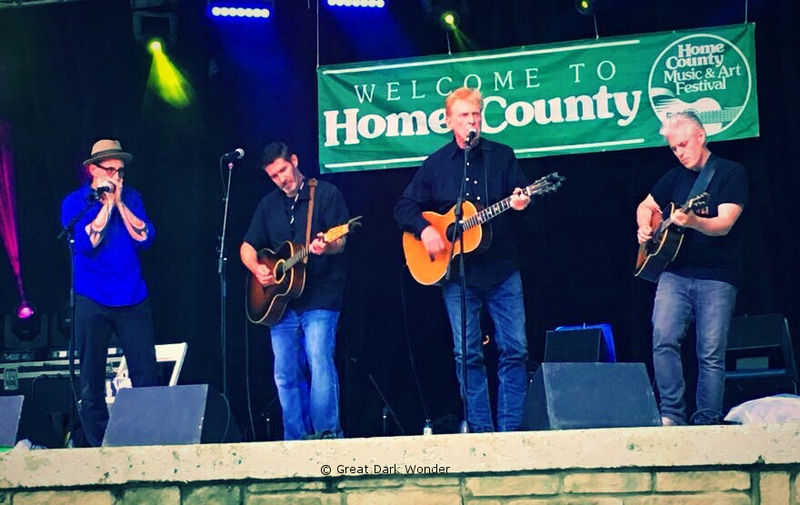 We encountered many artists last year at Home County who were previously unknown to us, and quickly became new favorites after enjoying their performances at the event. For this 45th anniversary year, if we had to choose one artist previously unknown to us, based on their live set on the main stage, it would have to be Mike Stevens. A quick internet search prior to his set informed us that Mike was a world class harmonica player, with a distinct bluegrass background and numerous performances on his resume at the Grand Ole Opry in Nashville, TN. Intrigued by this introduction, we knew that Mike Stevens was an artist that we absolutely did not want to miss. 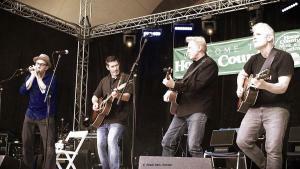 Performing on the main stage just prior to Tom Wilson on the Saturday night, Mike was accompanied by his friend and guitarist Jeff Getty, for a seven track tour de force of amazing harmonica and song. Whether entertaining the crowd with a song about Sarnia, ON (where he ‘talks’ into the harmonica to create a beat) or covering the classic tune “Amazing Grace,” Mike and Jeff immediately earned your full attention. And just when you thought you’d seen it all, with an outstanding rendition of “Orange Blossom Special,” if you watched closely enough, you may have been able to count how many times Mike switched harmonicas mid-tune to generate different tones and pitch changes. I’ve seen many a good harmonica player in my time, but this was simply out of this world. Harrow Fair: Main Stage, Saturday. Regular readers of this blog already know that we are huge fans of Harrow Fair. This incredibly talented duo of Miranda Mulholland and Andrew Penner are best experienced live, and as the top-billed act for the Saturday night at Home County, they did not disappoint. Drawing upon material from their debut “Call To Arms” album, Miranda and Andrew would also include some popular covers and even tease us with a brand new track that they have been working on. And unlike the previous evening, the weather was almost perfect by the time Harrow Fair hit the stage, prompting plenty of attendees to flock to the stage to experience this unique and endearing brand of folk music for themselves. With a powerful 13 track set list, Harrow Fair commenced with their standard back-to-back performance of “Told A Lie To My Heart “ and “I Will Be You Man;” allowing Miranda to demonstrate her amazing fiddle skills and Andrew his haunting blues guitar during the former, and multi-percussion abilities with the latter. Several tracks from their debut album were performed, including “Hangnail,” “Held Tight,” and the atmospheric “Been There Ways.” Earlier this year, we were fortunate to witness a great two track medley that blends “The Hunt” with a cover of the John Hartford hit “Long Hot Summer Days,” and were delighted to see Harrow Fair make this a feature within their set on the Home County stage. And of course, their popular covers were shared too, with Chris Isaac’s “Wicked Game” and the Memphis Minnie/Led Zeppelin hit “When The Levee Breaks” played to perfection. 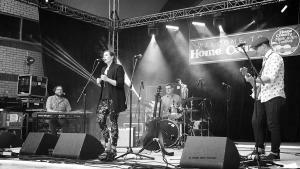 Midway through their performance, Miranda would announce that they are currently working on new material (hopefully a full sophomore album beckons). Excited to share one new, unreleased track, the duo would offer up “Shiloh,” an instrumental number that pays homage to the historic American civil war battle that took place in southwestern Tennessee in April 1862. 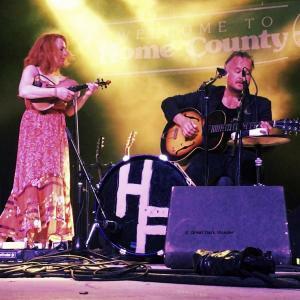 Another welcome addition to their recent set list is a cover of “Oh Shenandoah,” a traditional American folk song of uncertain origin, played with Harrow Fair’s raw and unbridled energy to close their set. Not quite ready to call it an evening, the crowd surrounding the stage at Home County applauded and hollered long enough to draw Miranda and Andrew back for an encore performance that included both “Bite The Way” and the Rankin Family classic, “Fare Thee Well Love,” amazing all with their fabulous two part harmonies. 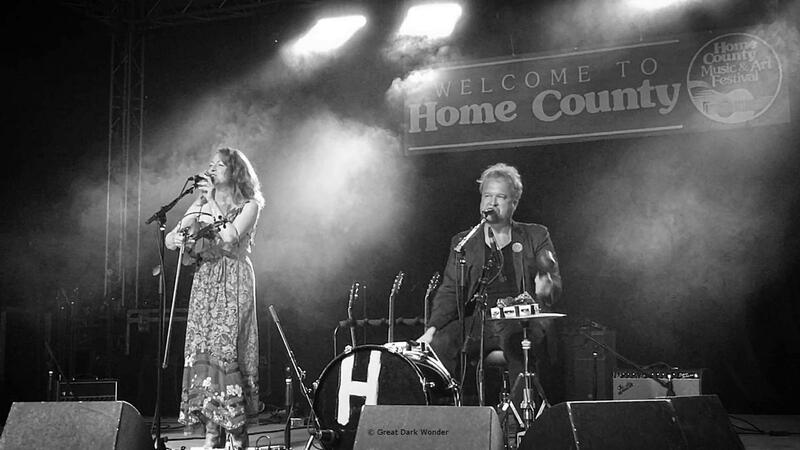 Just two years ago, Harrow Fair graced this stage as an “in-between” act, and now were back to headline the prestigious event on the Saturday night. This fact alone should tell you how far they have come in such a short space of time. We have lost count now of the number of times we’ve attended their shows, but we continue to crave more of their music and cannot wait for that imminent sophomore release.